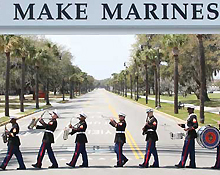 The Marine Corps Recruit Depot (MCRD) is located on Parris Island and several smaller islands approximately 4 miles south of the City of Beaufort, South Carolina. About 19,000 recruits are trained at Parris Island each year. The facility covers more than 8,000 acres, including more than 4,000 acres of salt marsh and tidal streams. This is where Marine Corps Recruits learn the core values of Honor, Courage, and Commitment.